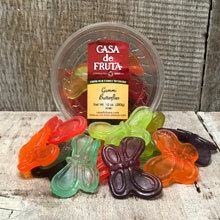 Fruity flavored chewy gummi butterflies to fill up your tummy. Packaged in a 10 oz. tub. NOTE: SHIPPING RESTRICTIONS APPLY: DURING WARM WEATHER. CHOCOLATE, TAFFY AND GUMMI TYPE PRODUCTS CAN BE SHIPPED MON/ TUES/ WED, OVERNIGHT OR 2-DAY AIR ONLY starting May 1st through October 15th. Occasionally, weather can be unpredictable. If the weather in delivery area is above 80 degrees during any month of the year we suggest the package be expedited.